Click here to go to our page on "why fifty ohms?" There are plenty of resources out there that will tell you that maximum peak power handling of coax occurs at an 30 ohms impedance of air-filled coax, we might have mentioned this a time or two. This rule is true for coax that operates below the cut-off for TE11 mode. Suppose you are operating very close to the cut-off of the unwanted TE11 mode. Heck, let's assume you want to operate exactly at TE11 cut-off. TE11 cuts off when (b+a)*pi is equal to operating wavelength. To cut to the punch line, at TE11 cut-off, ~44 ohms carries the most power. You can find this fun fact and many more in Introduction to Microwaves by Gershon J. Wheeler, dating back to 1963. Depending on your point of view, this is useless trivia, or a critically important information. We decided to solve coax equations to show how 44 ohms (in air) can provide the highest power handling. We got stuck with trying to take a derivative of a messy equation, so we solved numerically using Excel. Then for fun, we asked our good friend Alex did some math for us. There are two solutions on this page, and they even agree! 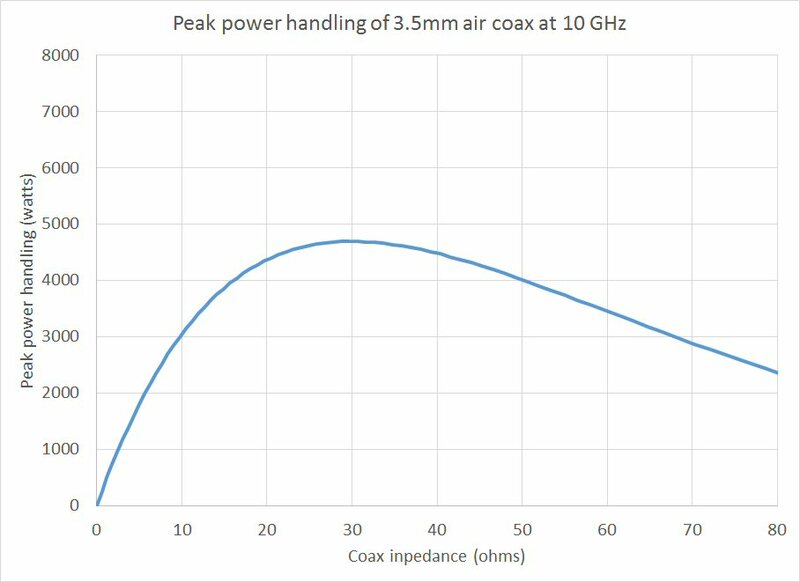 For review, let's first look at the peak-power handling curve for air coax at 10 GHz (actually, frequency does not play a part in this calculation, so long as we stay below TE11 cutoff). We chose the outer conductor diameter (3.5mm) and varied the inner conductor diameter to plot impedance versus power handling. We assumed 1,000,000 volts per meter critical field strength. The math says it is good for 4,994 watts peak, at exactly 30 ohms (this is where a/b=e/2, where "e" is Euler's constant, the base of natural logarithms). The curve needs to derated for temperature, altitude and load VSWR in real applications. Before you get excited that you could pass thousands of watts through air-coax, keep in mind that average power handling of a 3.5mm precision connector is only ~100 watts at X-band. The center-conductor is thermally isolated cannot take much heat before it starts melting its suspension donuts. Here's how we approached the problem... the TE11 cutoff solution starts by assuming a frequency (10 GHz in this example), varying the inner diameter "a" from 2mm to 5mm (it took some miscalculations before the best range was established), calculating the outer diameter "b" for the condition that the coax is at TE11 cutoff, then calcuating impedance and power handling and looking for the maximum. 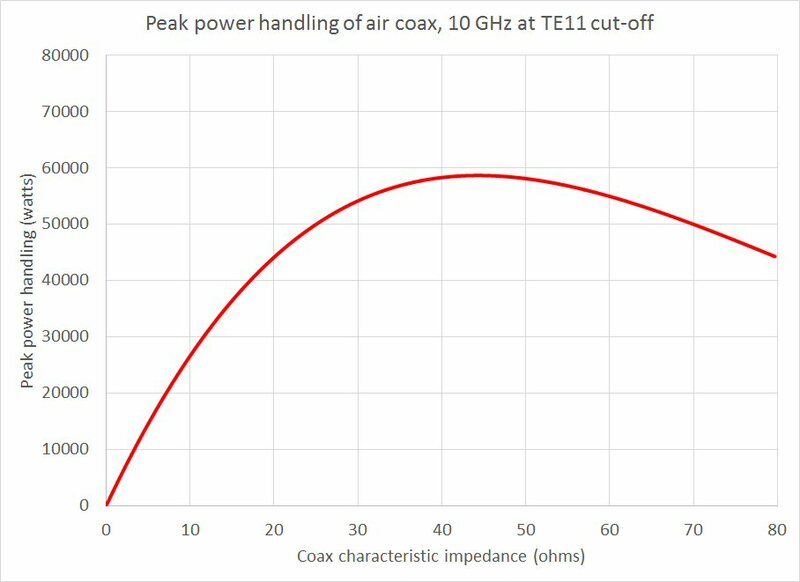 Below is a curve showing peak power handling of coax at TE11 cutoff at 10 GHz. Note that the Y axis increments are 10X larger than on the previous plot. Thus, power handling can be theoretically improved by more than 10X compared to 3.5mm coax at 10 GHz, if you operate on the edge of TE11. The reason for much higher power handling compared to 3.5mm coax is that that the TE11-sized conductors are much larger in diameter. Alex used Wolfram to do the computation, expressing power handling in terms of "a" like the numerical solution above, then taking the derivative with regard to 'a' and setting it to zero to find the maximum value. In order to solve for that derivative, Alex used a special function called Lambert W. If you are not familiar with Lambert W, you are in good company. Support small business, visit 810Labs' website and bring Alex any microwave analysis problems that you don't have the resources to solve! Alex came up with 44.330 ohms, we came up with 44.327 ohms, a small error on our part but no one should be worrying about fractions of an ohm in coax impedance in real life. It is nice to see the two solutions agree!